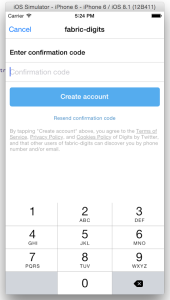 A couple weeks ago I watched a couple of talks on Twitter’s new product Fabric (www.fabric.io). It’s a collection of tools to make mobile developers’ lives easier. 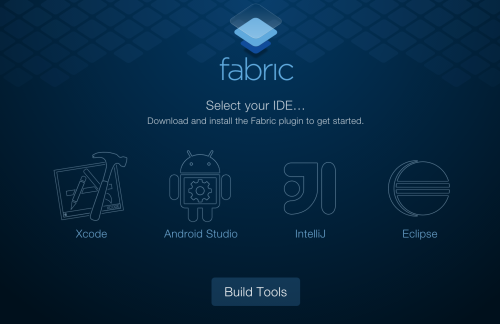 According to their documentation, Fabric is more specifically a “set of mobile development tools called ‘Kits’ that help you make your app more stable, add social features like sharing and login, and turn your app into a business with easy monetization.” You can read more about Fabric and the Kits here: https://dev.twitter.com/overview/documentation. 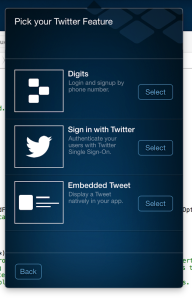 Crashlytics – Once included in your application, this gives your app analytics, crash reporting, and more. Honestly, this could have come in handy if I had known about the product earlier. Twitter Kit – Gives your app capabilities to more natively access Twitter features such as composing a tweet, and other social integrations. One of the interesting aspects of this Kit is something called Digits. 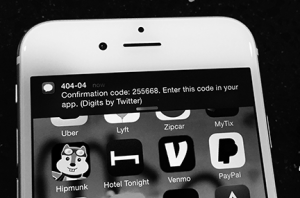 Instead of having your users log in through their Twitter account, they can also log in through SMS without having to worry about a 3rd-party API for infrastructure, or another site having some access to their social history. Mopub – Helps you monetize your app with advertising. I didn’t touch this functionality while playing around with their product. 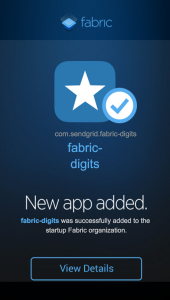 I’m going to walk through installing Fabric.io and integrating Digits into my application. One of the first things I noticed is how easy and seamless the whole process was. Probably the best experience I’ve had when dealing with another company’s tool on improving the mobile development experience. 3. Follow the directions of the plugin in the bar. This was one of the best experiences I’ve personally had when developing a mobile app. 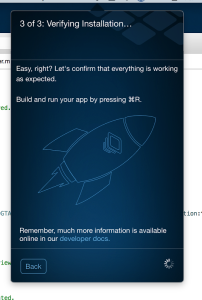 It walks you through running a build script for every time the app is built and ran. This works out great, because it lets fabric know if everything is set up properly and it sends you an email if it is (through SendGrid!). A really seamless experience. It let me know what files I needed to modify and how to get started. 5. 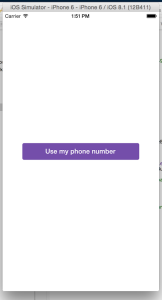 The end result was creating an app that lets me use SMS for logging users in without having to use a 3rd party SMS provider and worry about those costs. Pretty powerful in my opinion. Check back into the SendGrid Blog every Monday, Wednesday, and Friday for the next few weeks to see what I’m working on! You can also visit my intro post that will have an updated list of everything I’ve written for my 15 Days of Code Challenge.